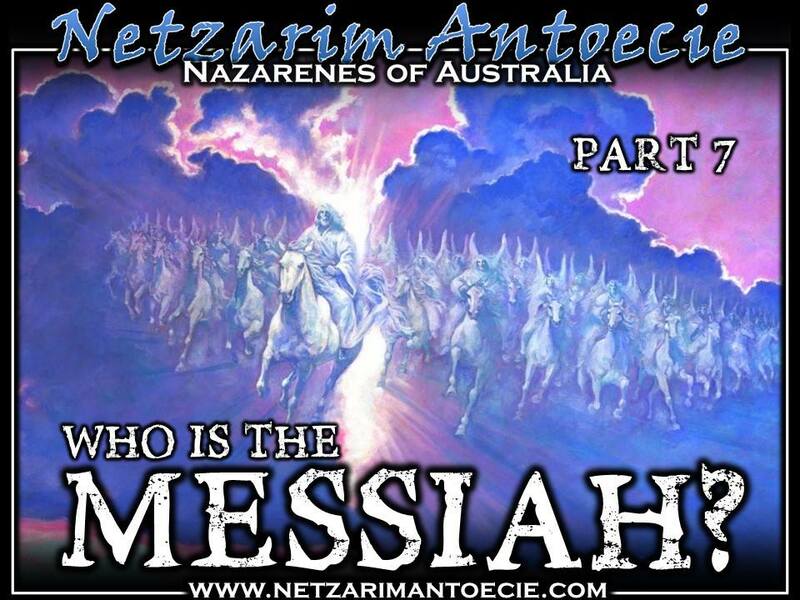 Reviewing Who is the Messiah? Messiah is Yahweh’s salvation, our Yahshua. “…you are to give him the name Yahshua, because he will save his people from their sins (Matthew 1:21)” He is ‘Our salvation that we’ve cried out for.’ The multitudes cried “Hoshanna!” which is yasha (“deliver, save”) and anna (we “beg, beseech”). He is the son of man (Hebrews 2:6). He was fully human, knowing our hardships and suffering. The son of man in Hebrew as בן–אדם, ben-'adam. This expression appear 107 in the TaNaK and it’s mostly used in reference to Ezekiel. Being the anointed King of Israel. He will restore the Temple in Jerusalem (on the heels of an imposter). He will bring peace to the world and end all war. And he will bring knowledge of Elohim to the whole world. So that’s sixteen faces of who Messiah is. How many of you could have rattled of more than four if asked on the spot by someone, who the Messiah is? Most people struggle after two. (Slide) Those that have been following this series, this is what we know so far of who Messiah is. Most people, if asked who Messiah is will simply say he is my saviour or deliverer or redeemer and that’s about where it ends. This isn’t wrong, but it’s strange. Why is this strange? Well, imagine you had a father who you loved very much, you grew up with him as your mentor, teacher, playmate, and protector. One evening after a movie finished particularly late in the city, you and a friend are followed along a quiet dimly lit street by a gang of youths. They draw nearer and nearer looking as they’re going to definitely mug you both or worse. Out of nowhere and in the nick of time your father appears in his 57 Chevy and opens the door, yelling get in, and you are saved. Imagine being ask about your father and referring to this event as the only thing you can say about him. Weird. (Slide) The big question is, why focus on the different names of Messiah, when the subject is about who he is, not what his names are? A name denotes a person’s character. By finding out a person’s name, you find out who they are. A name is a memorial that outlasts a person’s earthly body and stands throughout the generations as a testimony to the mission that exceeds individual lifetimes. Messiah has one name, but there are many faces to that name, we would otherwise call titles. This is because his mission is multifaceted. He’s always been more than a Messiah who came once as a suffering servant, died and resurrected and promised to return as a conquered king with a mighty host. What’s acutely interesting about Yahshua’s declaration is that his ministry was a rescue mission to a lost people, a particular people, rather than an aimless meander through the countryside doing miracles and reforming an old religion. “Do not go among the Gentiles or enter any town of the Samaritans. Go rather to the lost sheep of Israel. (Matthew 10:6)” Yahshua is telling his talmidim, if there’s no lost sheep of Israel in a particular Gentile or Samaritan city, don’t even go there. (Slide) Messiah came to support what the prophets had said by coming in the manner, acting in the manner and exiting in the manner of their verbal forecasts, which were written down. ‘Fulful’ is to fill something up, whereas to cancel is to empty out or abort something’s use. Today, more people have fascinating fixation over what HaSatan is doing, rather than what Yahshua is doing. You’ve often heard the expression, “the devil goes by man names” and most people are aware of a few, the Dragon, the Adversary, the anti-Messiah, the Beast, the Deceiver, the Accuser, the False Prophet, the Evil One, King of Babylon, the Man of Sin, little Horn, and Beelzebub to name a few. These describe all facets of his character and mission. How well we know somebody is weighed against how well we know the variety of roles and purposes a person has. Messiah knows who he is, what his mission is, and who we are and he loves us more than we could ever fathom. “I am the living bread that came down from heaven. If anyone eats of this bread, he will live forever. This bread is my flesh, which I will give for the life of the world. (John 6:51)"
(Slide) Messiah is the Bright and Morning Star: "I, YahShua, have sent my angel to give you this testimony for the congregations. I am the Root and the Offspring of David, and the bright Morning Star. (Revelation 22:16)"
(Slide) Messiah is the Dayspring or the Rising Sun: “… Zechariah was filled with the Holy Spirit and prophesied: "Praise be to Yahweh, the Elohim of Israel, because he has come and has redeemed his people. He has raised up a horn of salvation for us in the house of his servant David (as he said through his holy prophets of long ago), salvation from our enemies and from the hand of all who hate us— to show mercy to our fathers and to remember his holy covenant, the oath he swore to our father Abraham: to rescue us from the hand of our enemies, and to enable us to serve him without fear in holiness and righteousness before him all our days. And you, my child, will be called a prophet of the Most High; for you will go on before the Lord to prepare the way for him, to give his people the knowledge of salvation through the forgiveness of their sins, because of the tender mercy of our Elohim, by which the Dayspring (rising sun) will come to us from heaven to shine on those living in darkness and in the shadow of death, to guide our feet into the path of peace. (Luke 1:67-79)"
(Slide) Messiah is the Good Shepherd "I am the good shepherd. The good shepherd lays down his life for the sheep. (John 10:11) “He tends his flock like a shepherd: He gathers the lambs in his arms and carries them close to his heart; he gently leads those that have young.” (Isaiah 40:11) The most fitting imagery imaginable that depicts Messiah and his followers is that of a shepherd tending his flocks.